Happy Easter! On this gorgeous Spring morning, I decided to let Keith sleep in and make a nice breakfast for my next installment of What Micky Eats...At Home. 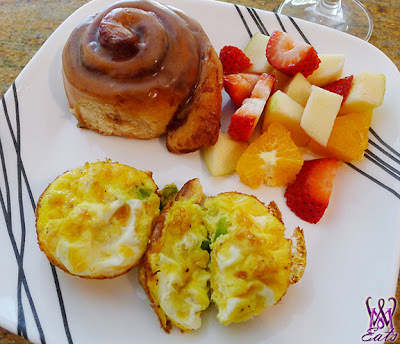 With a menu consisting of savory mini omelettes, sweet cinnamon rolls, fruit salad, and tropical mimosas, I'm sure you'll want to start out every morning this way! I was pinspired by a few different recipes for mini omelettes and since Keith requested bacon, I decided to make a "western" version. I thought the mini presentation using a cupcake pan was cute and an easy way to divvy out portions, since we wanted other items to compliment the meal. - In a large saute pan, over medium high heat, brown bacon pieces for about 5 minutes. - Remove from heat and drain bacon pieces on a paper towel lined plate. - Add vegetables to the hot pan to heat through. 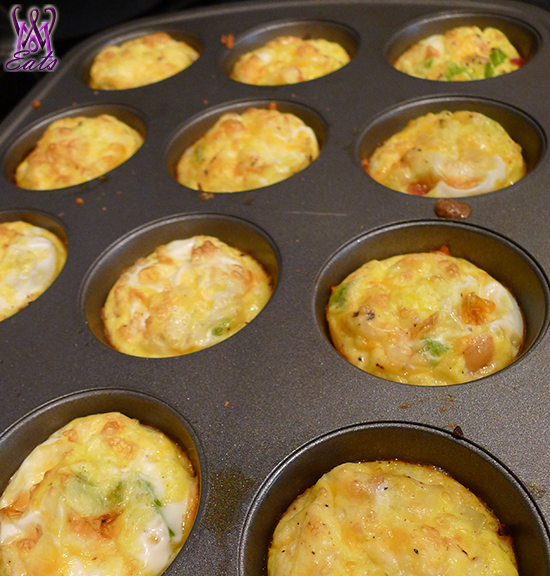 - In a medium bowl, whisk together eggs and milk. Season with salt and pepper. - Lightly spray a 12-cupcake pan with cooking spray. 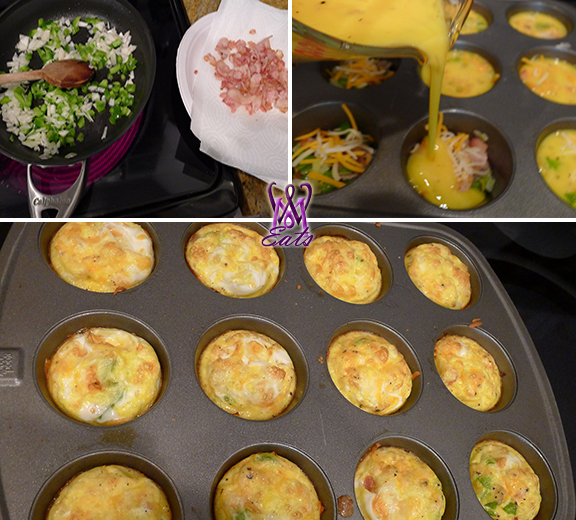 - Spoon out the bacon and veggie mixture evenly into each cupcake. Top with grated cheese. - Pour the eggs over mixture until a little more than ¾ full. 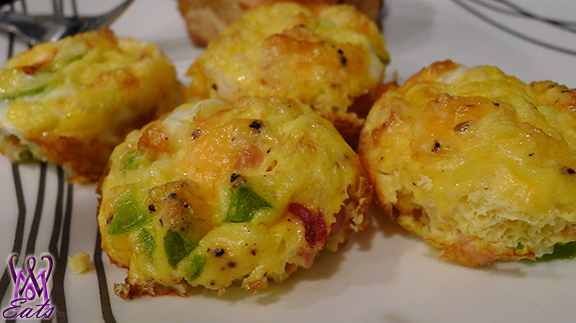 - Sprinkle with remainder cheese and bake for 15-20 minutes. - Serve immediately. Wrap any leftovers in plastic wrap and store in the refrigerator to enjoy during the week. Try this recipe substituting your favorite ingredients: broccoli and cheese; spinach and mushroom; or sausage, etc. Twelve mini omelettes were more than enough for the two of us. I will definitely make this again and love how easy it is to take a left over mini with me to work. To go along with the mini omelettes, I also made cinnamon rolls (full disclosure: I bought the tube can version from the store. Maybe next time I will be more ambitious and make them from scratch.) and a simple fruit salad using apples, oranges, and strawberries. Just slice up any fruit you have on hand, and squeeze a bit of the orange juice over it to keep the fruit bright. You can prepare this ahead of time and keep cool in the refrigerator. To drink, I made tropical mimosas using pineapple-passion fruit juice and some champagne. An exotic twist on the regular orange and bubbly drink. Keith was happy to sleep in while I "slaved away" in the kitchen. We both enjoyed this wonderful Easter breakfast...At Home.